These are some of the most frequently asked plumbing related questions that we get from our customers. Will a tankless water heater work for me? In most cases, yes! There are very few situations in which tankless water heaters will not work (you can ask a top tankless water heater technician about these), and most will work in areas where conventional storage tank water heaters would not. Most tankless water are about the size of a briefcase and require about 120V, 60Hz and 3 amps of power – requirements almost any house meets. How can I check if I have a water leak? Can leaks get bigger over time? Yes. Water leaking out of your pipes or fixtures will eventually cause enough corrosion that even a pinhole-sized leak can eventually grow and potentially cause damage to your home. Why do my pipes rattle and make noise? Quite likely your water lines are not properly secured, meaning there are some spots where they rub up against your floor joists. If you call us we can make sure your pipes are properly secured and install pipe hangers between your pipes and the joists to eliminate any noises. Should I repair or replace a leaky faucet? If you can repair the faucet and restore the shine on its finish, faucet repair is a option. However, if your faucet is too badly corroded or too old to find replacement parts, faucet replacement may be easier (and possibly cheaper!). Why does water back up into my sink when I run the dishwasher? Quite likely this means there is food stuck in your disposal. Since the disposal drain and dishwasher drain are connected, a blockage in one will lead to a backup in the other. To prevent this from happening, always make sure your garbage disposal is free of food particles before turning on the dishwasher and always run the garbage disposal with plenty of cold water. If it gets really bad, you can plug up the sink, fill it with water, then remove the plug and run the disposal. The weight from the water should help force out whatever is backed up in the drain, eliminating the blockage. If this doesn’t work, give us a call! Why is my water heater’s relief valve leaking? • Incoming water pressure from the main water line is too high. • Thermal expansion (water expanding in volume as it is heated) is causing the pressure to build up. The easiest way to deal with a leaky relief valve is to give us a call to get it replaced. 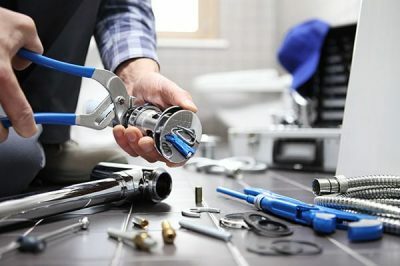 Reliable Plumbing Service in Vancouver, WA and the surrounding area. Powered by Infinite Color Inc.